I’ve been spending most of my PS4 time over the past couple of months playing H1Z1 and now Realm Royale, and I have to say I find the Battle Royale genre far more enjoyable on the consoles than on PC. Maybe it’s because of the rampant cheating on PC, maybe it’s because I’m 30 and my reflexes just don’t hold up on a platform where the base can shoot a hair off of a fly from two miles away. Regardless, I’m enjoying myself. Realm Royale is Hi-Rez Studios loading the style and gameplay elements of Paladins into a cannon and firing it at PUBG. While the base gameplay elements will be familiar to those who have played other games in the genre, Realm Royale is carving a niche all of its own. On the familiar side, you have up to 100 players jumping from a flying bus on to a giant island where they must battle either alone or part of teams in order to be the last person/team standing. Each player starts with a melee weapon and must scrounge around for better quality items so that they may rain down death upon whoever happens to get in their crosshair. I haven’t played Realm Royale on PC in about a year, so my knowledge of that version is too far out of date to make comparisons. 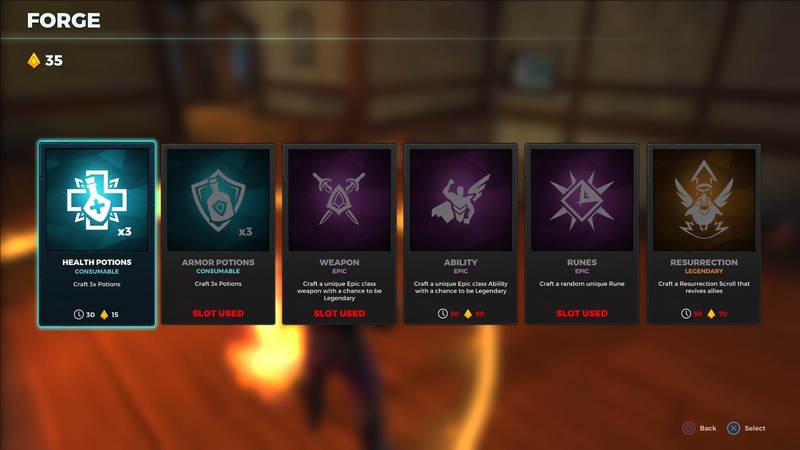 While the base concept is the same, Realm Royale has quite a bit that sets it apart from the competition in terms of meta gaming and quality of life features. Before the round begins, the first thing you’ll do is choose a class. There are four classes, each with their own perks and weaknesses, such as the assassin gaining 300 health on each kill and the warrior having a higher maximum health and dealing more damage with melee weapons. Each round in Realm Royale starts with you jumping out of the bus and careening down to a spot of your choosing. The goal from here on out is a prolonged arms race in which you travel about the countryside, opening chests, grabbing weapons, and murdering anyone who happens to cross paths. As time progresses, a circle of fog gradually encircles the map, restricting the play field until one person is left standing. One quality of life feature I like about Realm Royale is that everyone has a mount, accessible with a simple d-pad click. In games like H1Z1 where your starting location is predetermined, it’s possible to get screwed because the game stuck you in the middle of nowhere on the edge of the map with little access to weapons or transportation, leaving you to spend the round just barely keeping ahead of the fog if at all. 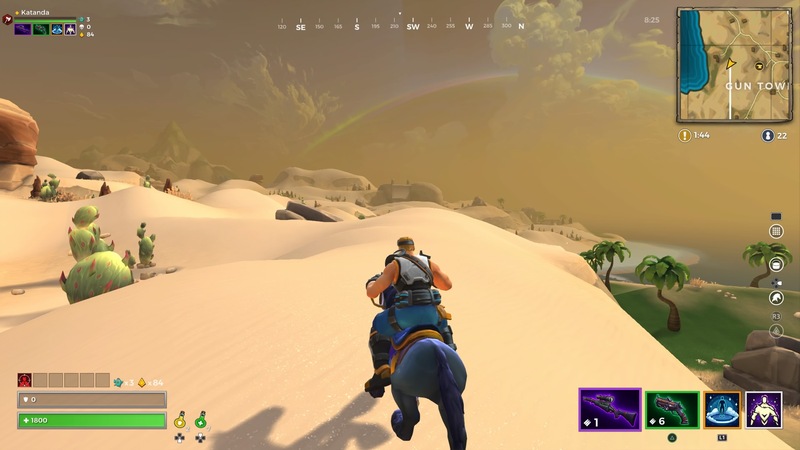 In Realm Royale, you always have the ability to get where you need to go and fast, and the map is populated enough that you’ll have no problem amassing an arsenal. The balance to this convenience is that you can be knocked off the mount with a single hit. In addition to your pistols, rifles, shotguns, and magic staffs, player power is also strengthened by picking up various runes and powers scattered around the world. Powers can vary in usefulness, such as one that turns you invisible for a short period of time, one that grants temporary flight, concussion grenades, incendiary grenades, shields, health, etc. Runes, meanwhile, are passive powers that can give you a hell of an advantage on the field, offering perks like regenerating shields, making survival as a chicken easier, and resisting knockback. Even death in Realm Royale is handled differently. Most battle royale games have a knock-down mechanic in squad modes, where you aren’t instantly killed but instead are knocked out and can be revived by a teammate. In Realm Royale, losing your HP (even in solo) means turning into a chicken that can run and jump around. If you manage to survive until the timer hits zero, you’ll get back into the fight with a certain amount of health. If you are killed as a chicken, or you get turned three times, you’re out of the match. Certain runes found during gameplay can increase your speed, your health, and decrease the timer while in chicken mode, giving survival a strategy all on its own. The benefit of this is that you rarely get that sudden game over that accompanies other similar titles just because someone with an epic sniper rifle managed to blow your head off through an open window. It also makes encounters with multiple people all the more dangerous, as you can be easily popped while chasing after the player you’ve just chickened, or similarly being the first to go down may present an opportunity to escape and recuperate while everyone turns the guns on each other. Another thing Realm Royale has going for it is the ability to break down weapons you come across and use shards at forges to craft new items. The catch is that each forge can craft one of each category: health, armor, weapon, runes, ability, and revival (squad mode) so you can’t amass shards and use them to bulk up on potions. The crafting forge takes time and makes sound, which can mast incoming players. It also displays a timer that can be seen by other people, so you can tell when someone is waiting inside. You don’t need to be physically near the forge in order for the time to count down, so you can easily start the queue and hop off to a vantage point to stay safe. There are also nuggets that you’ll find by looting chests, killing players, and making rank. 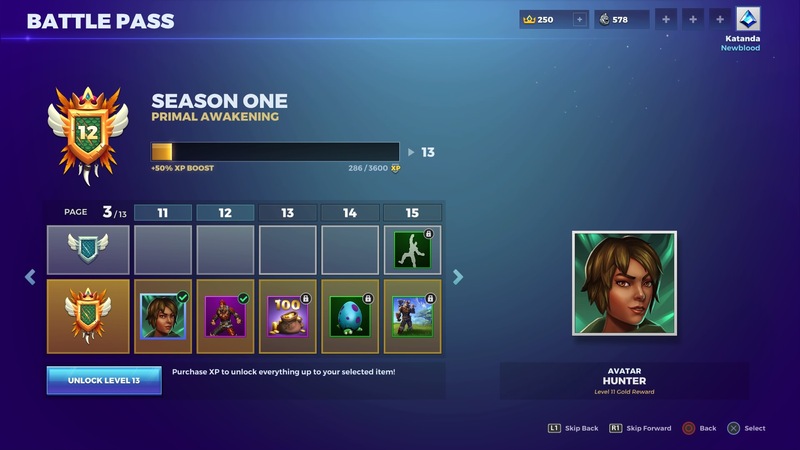 Nuggets are the in-game currency for Realm Royale, usable to buy cosmetics from the in-game shop. 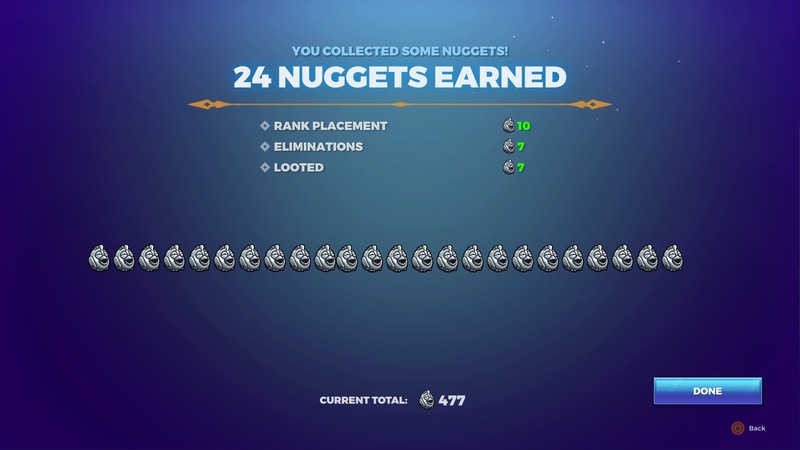 Gaining generally less than a dozen per game, and considering that most rewards are in the realm of thousands of nuggets, it’s a feature that isn’t even worth paying attention to. I do like that Realm Royale’s battle pass seems to be very easy to level up, I have personally managed one level about every 1-2 matches, but that the game also rewards you with crowns. The first battle pass costs 750 crowns and can reward about 1,100 crowns if you manage to level it up all the way. By this logic, it should be possible to heavily discount or get the next pass completely free, depending on how many crowns you obtain during the course of the season. The season does not indicate when it ends, however, or if crowns can be used for the next season. I contact Hi-Rez about these details and have not received an answer. One aspect of Realm Royale I find odd is the inclusion of bot players, mostly because they aren’t indicated as such and Hi-Rez to my understanding and research doesn’t acknowledge their presence in the game. I’ve been playing shooters for more than twenty years, I can generally recognize when a game is using bots by their very obvious behavior. Realm Royale is clearly using bots, as I was able to repeatedly confuse bots causing them to go into animation loops or completely break, being unable to properly walk through a door or constantly moving back and forth on the same spot of land making movements that a normal player shouldn’t be capable of. Let me be clear on this: I’m not against bots being in a battle royale game, I just find Hi-Rez’s actions surrounding their implementation to be strange. I reached out to Hi-Rez for an official comment and despite stating that I would receive an answer over a week ago, I have not. I will update this piece if I do receive a comment on the season pass questions or regarding bots. 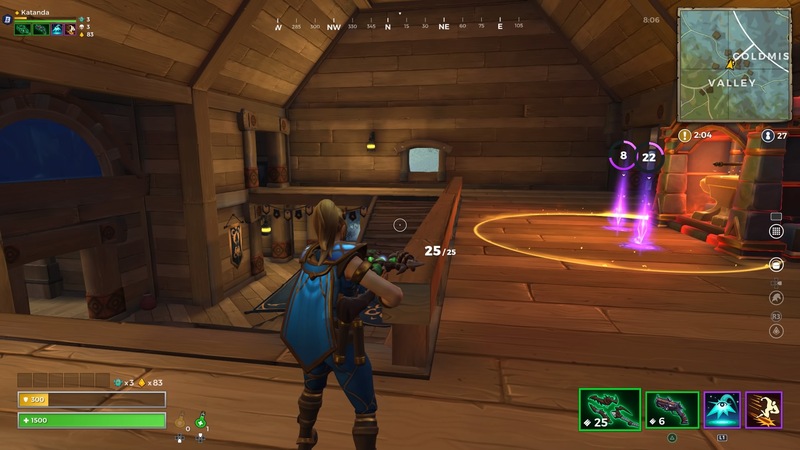 My only real gripe with Realm Royale right now is in relation to a certain unbalanced pistol that can be found/crafted in-game. The poison/fire pistol is severely unbalanced, extremely powerful, and can basically win you a match. The weapon is trash and going up against anyone with one is guaranteed to ruin your mood.